This Kensight Defensive Adjustable Rear Night Sight is Fully Adjustable for both Elevation and Windage and is a versatile sight upgrade for a concealed carry or duty pistol that may also see use in competition or target shooting endeavors. The rear sight body is Wire-EDM machined from 4140 Chrome Moly Steel that is then heat treated to a hardness of RC 38-40, ensuring tight part-to-part fit and long-lasting durability. Click-adjustments are positive and precise, allowing a reliable and consistent POI (point of impact) adjustments. 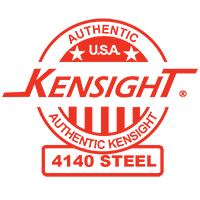 This Kensight Rear Night Sight is equipped with a Partially Serrated Slanted Blade for reduced glare, and incorporates a Trijicon self-luminous Green Tritium Lamp nestled within a High Visibility White Dot on either side of the rear sight notch for a sight picture that's quick to acquire and equally useful in both low light and bright light conditions. This rear sight fits the popular Novak LoMount rear sight dovetail cut, often found on many factory-produced and custom 1911 pistols. Technical Information: Material: 4140 Chrome Moly Steel Blade Type: Slanted, Serrated w/2 High Visibility Green Tritium Dots (0.076" Dia) Sight Dovetail: Novak LoMount (65 Degree x 0.495") Elevation Adjustments: Yes Windage Adjustments: Yes NOTE: This rear sight sits a little higher than standard and Requires a Minimum Front Sight Height of 0.230". I purchased these for my colt defender. They are very well made and the tritium lamps worked as expected. Installation of the rear sight required the expected fitting for a 1911. The front sight however is a slip fit and comes with about a .065" hole drilled vertically through the front of the blade for the supplied roll pin to hold the sight in place which requires drilling of the top of the slide. For someone like me this was not a huge issue because I have the equipment and experience to do it. I was still hesitant to drill a hole in the slide of my 900$ 1911. I looked again at the product description and found no mention of this feature. Making sure the customer knows that drilling the frame for the roll pin may be necessary would give these sights, specifically the front, 5 stars. Reply By Kensight: The front sights are not required to be pinned in place, however some 1911 manufactures do offer this option. Since our sights have a slightly oversized dovetail, they can be fitted tightly and no pin is needed. I always place a drop of Blue Lock-Tight under my personal sight installs as added security ..but again it is not a requirement.